This video clip is taken from the 2015 American League Championship Series. 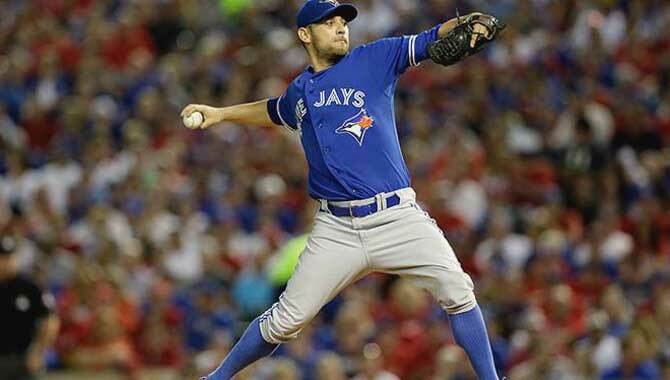 Pitcher Marco Estrada is facing batter Eric Hosmer. Estrada starts in the windup position then transitions to the set position before delivering the pitch. This seems to be against the rules and is an illegal pitch. Since he assumes the windup position, then shifts into the set position he is clearly interrupting his commitment to pitch the ball. he may take one step backward, and one step forward with his free foot. both hands in front of his body and coming to a complete stop. one hand on his side; from this position he shall go to his set position. If there were men on base this would be an attempt to deceive the runners and would surely be a balk. Since no one is on base I think it should be an illegal pitch and the batter awarded the call of a ball by the umpire. So, what do you say? Is this an illegal pitch? Or is it legal? Give reasons for your answer.